I am sure you have heard that Michael Flynn resigned as National Security Adviser last night amidst allegations that he spoke of sanctions with the Russians before Trump took office. I have never cared for Michael Flynn. I gave him a clean slate when he came in. But after hearing what transpired, resigning was the right thing to do. I don’t know whether he resigned of his own volition or at the behest of President Trump, but he had to go. He spoke to the Russian ambassador five separate times. You can bet the intelligence agencies have that on tape. When Mike Pence asked him if he had discussed sanctions, he lied to him and Pence went forth and looked like a fool over it. The word out there is Pence was furious. Kellyanne Conway came right out and said that lying to Pence was the deciding factor here. Michael Flynn was originally fired by Obama after serving a couple of months under him. He only lasted a couple of weeks with Trump and he probably would have been gone sooner, but Trump remained loyal to him. As recently as 2014, Flynn had gone to Russia before Trump came into the picture. The Department of Justice warned the White House that Flynn was susceptible to blackmail from the Russians. Just before Trump came into office, Obama levied sanctions on Russia. Normally, the Russians would have struck back, but did not, saying they would wait for the Trump presidency. That was after calls from Flynn, who most likely assured them that sanctions would be lifted. This whole mess is complicated. You have nine leakers involved that went to the media. These are probably a mix of White House insiders (leftovers from the Obama administration) and intelligence people. “In the end, it was misleading the vice president that made the situation unsustainable,” Conway told TODAY’s Matt Lauer. The incomplete information or the inability to completely recall what did or did not happen as reflected in his debriefing of particular phone calls — that really is what happened here,” she said. Flynn’s departure comes less than a month into the job and follows revelations about information he shared with Russian Ambassador Sergey Kislyak over American sanctions against Russia in late December, weeks before Trump took office. “He knew he had become a lightening rod and he made that decision,” Conway said. On TODAY, Conway was asked repeatedly why, despite reports that the Justice Department told the White House last month that Flynn had misled them and even put himself at risk for blackmail, he continued to retain the president’s full trust. 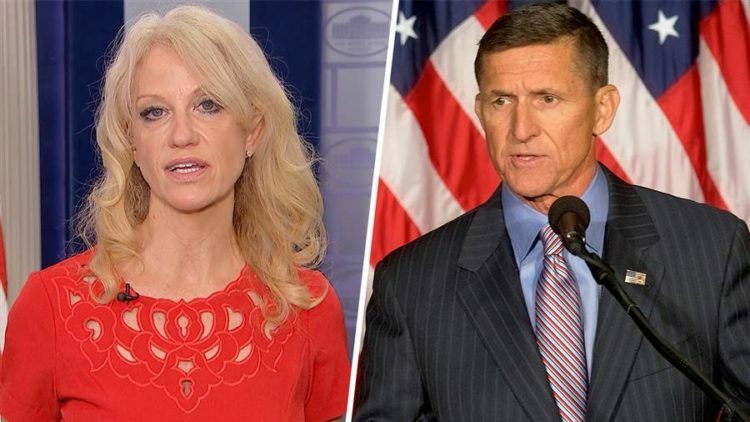 She said that the president accepted Flynn’s resignation and “wishes him well, and we’re moving on,” noting three “very strong candidates” the administration is considering to replace him. Arguably, Flynn was the worst pick of those chosen for Trump’s cabinet. I am not sad to see him go as I feel he was compromised by the Russians. I’m also not happy about it as it hurts the Trump administration deeply and exposes a very dangerous rift between Trump and the intelligence agencies. The left will also use this to accuse Trump of further connections with Russia. Trump needs to aggressively clean house in the White House and intel agencies and get rid of everyone who was ever even remotely connected to Obama. If I were him, I’d have Pompeo in my office this morning, reaming him a new one over this. There appears to be chaos in the People’s House right now and that just can’t be allowed. The Democrats won’t care about the truth, just nailing Trump every way they can. They also don’t care that it hurts the country and puts us at risk. The media is celebrating this today and that is just despicable. Thankfully, Trump has three solid contenders to replace Flynn. Kellogg would be my choice at this point. It doesn’t matter how I feel about Flynn personally… this is a massively bad thing to happen so shortly after Trump takes office. Time to get serious and perhaps try some of that extreme vetting within our own leadership.